From 1835 to 1907, the Currier & Ives printmaking company produced over a million lithograph illustrations of events, portraits, and scenes from American life. In the era before photography and the widespread use of illustrations in newspapers, people could buy these inexpensive and widely available images of events and places they had never seen. 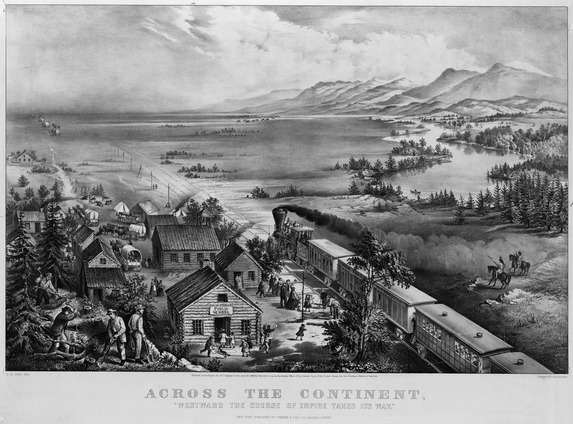 This 1868 illustration shows an idealized version of the transcontinental railroad expanding into the West. Cite This document | J.M. Ives after Frances Flora Palmer, “Across the Continent: 'Westward the Course of Empire Takes its Way',” HERB: Resources for Teachers, accessed April 22, 2019, https://herb.ashp.cuny.edu/items/show/1176.